A shortened lunch menu is available 2:30pm-4:30pm while the kitchen prepares for dinner service. A $3.00 charge is applied to split entrees. Consuming raw or undercooked meat, poultry or seafood may increase your risk to food borne illness. Sukie’s Sassy Sangria ~ Grenache, Marinated Orange & Lemon Slices, Shaken and Served over Ice with a Dash of Cinnamon. Great product, well prepared and beautifully served is our goal. Your servers are well versed on the nuances of the menu. Please ask for assistance. Also, the Chef is generally in the house and loves talking to you about the menu. Split charges may apply. Consuming raw or undercooked meat, poultry or seafood may increase your risk to food borne illness. 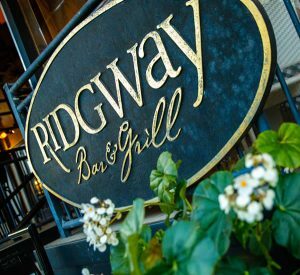 All wines served in Ridgway Bar & Grill are available for purchase in Tony’s Off Third, adjacent to the restaurant. Tony Ridgway’s menus are the expression of a seasoned chef’s distinct style, honed over an illustrious 47-year career as Naples’ leading chef, embracing our customers’ all-time favorites as well as reflecting Tony’s sense of culinary adventure and curiosity. Overall, his menus reflect classic American cuisine entwined with timeless French culinary traditions. We take great care in sourcing exceptional ingredients, and produce as much as we can from scratch and in-house, including all our breads and desserts, some pastas, all sauces and soups, and much more. You will find the freshest Florida Gulf Shrimp, artisanal salad greens, meats from Niman Ranch, gelatos made in Naples by Freddo Gelateria, and the list goes on! Whether joining us for a casual lunch, brunch, or dinner, or a more formal occasion, and whatever your appetite or dietary needs, you will find our menus and chefs accommodating. Co-owner and wine director, Sukie Honeycutt, has scripted a wine list of more than 600 selections, with a special emphasis on boutique and limited production wines, some so rare that they can be found in only a few places in the U.S. You will also find a robust list of wines by the glass that represent great values from around the world. Desserts and breads are fresh-baked every day at our award-winning Tony’s Off Third bakery, which is adjacent to the restaurant. Come share our passion for food, fun and friends. Check out our special function menus. “We like it in your restaurant.